İnternal kök rezorbsiyonunun etiyolojisi tam olarak anlaşılamamıştır. Travma ve kronik pulpitis ana risk faktörleri olarak düşünülmektedir. Proses genellikle asemptomatiktir ve rutin radyografik inceleme sırasında teşhis edilir. 30 yaşında erkek hasta, üst çene lateral dişine kompozit dolgu sonrasında gece ağrısı ve şişlik şikayetleriyle fakülte kliniğine başvurdu. Radyografik inceleme üst çene santral kesicilerde internal rezorbsiyon olduğunu ortaya çıkardı. Konik ışın hüzmeli bilgisayarlı tomografi incelemesi bu durumu doğruladı. Üç dişe kök kanal tedavisi uygulandı, ancak lateral kesicinin kök kanalı apikal üçlüye ulaşmaya müsaade etmedi. Bu nedenle tedavi planlamasına ek olarak cerrahi uygulamada eklendi. Bu vaka raporu üst çene kesici dişlerdeki internal rezobsiyona ortograd ve lateral kesiciye ise retrograd uygulamayı anlatmaktadır. Patel S, Ford TP. Is the resorption external or internal? Dent Update. 2007; 34:218-20, 22, 24-6, 29. Tronstad L. Root resorption-etiology, terminology and clinical manifestations. Endod Dent Traumatol. 1988; 4:241-52. Levin L, Trope M. Root resorption. In: Hargreaves KM, Goodis HE, eds. Seltzer and Bender’s dental pulp. Chicago, IL: Quintessence Publishing Co Inc; 2002. pp.425-48. Gulabivala K, Searson LJ. Clinical diagnosis of internal resorption: an exception to the rule. Int Endod J. 1995;28:255-60. Frank AL. External-internal progressive resorption and its nonsurgical correction. J Endod. 1981;7:473-6. Andreasen JO. Luxation of permanent teeth due to trauma. A clinical and radiographic follow-up study of 189 injured teeth. Scand J Dent Res. 1970;78:273-86. Heithersay GS. Management of tooth resorption. Aust Dent J. 2007; 52:S105-21. Maini A, Durning P, Drage N. Resorption: within or without? The benefit of cone-beam computed tomography when diagnosing a case of an internal/external resorption defect. Br Dent J. 2008; 204:135-7. Goldberg F, Massone EJ, Esmoris M, Alfie D. Comparison of different techniques for obturating experimental internal resorptive cavities. Endod Dent Traumatol. 2000;16:116-21. Torabinejad M, Pitt Ford TR. Root end filling materials: a review. Endod Dent Traumatol. 1996;12:161-78. Johnson BR. Considerations in the selection of a root-end filling material. Oral Surg Oral Med Oral Pathol Oral Radiol Endod. 1999; 87:398-404. Kim S, Kratchman S. Modern endodontic surgery concepts and practice: A review. J Endod. 2006; 32:601-23. von Arx T, Hanni S, Jensen SS. Clinical results with two different methods of root-end preparation and filling in apical surgery: Mineral trioxide aggregate and adhesive resin composite. J Endod. 2010;36:1122-9. Cohenca N, Simon JH, Roges R, et al. Clinical indications for digital imaging in dento-alveolar trauma. Part 1: Traumatic injuries. Dent Traumatol. 2007;23:95-104. Forsberg J, Halse A. Radiographic simulation of a periapical lesion comparing the paralleling and the bisecting-angle techniques. Int Endod J. 1994;27:133-8. Tyndall DA, Clifton TL, Webber RL, et al. TACT imaging of primary caries. Oral Surg Oral Med Oral Pathol Oral Radiol Endod. 1997;84:214-25. Patel S. New dimensions in endodontic imaging: Part 2. Cone beam computed tomography. Int Endod J. 2009;42:463-75. Patel S, Ricucci D, Durak C, Tay F. Internal root resorption: A review. J Endod. 2010;36:1107-21. Bystrom A, Claesson R, Sundqvist G. The antibacterial effect of camphorated paramonochlorophenol, camphorated phenol and calcium hydroxide in the treatment of infected root canals. Endod Dent Traumatol. 1985;1:170-5. Andersen M, Lund A, Andreasen JO, Andreasen FM. In vitro solubility of human pulp tissue in calcium hydroxide and sodium hypochlorite. Endod Dent Traumatol. 1992;8:104-8. 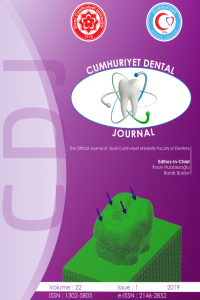 Turkun M, Cengiz T. The effects of sodium hypochlorite and calcium hydroxide on tissue dissolution and root canal cleanliness. Int Endod J. 1997;30:335-42. Gencoglu N, Yildirim T, Garip Y, et al. Effectiveness of different gutta-percha techniques when filling experimental internal resorptive cavities. Int Endod J. 2008;41:836-42. How to cite this article: Hakan Arslan, Serhat Köseoğlu, İsmail Davut Çapar, Elif Tarım Ertaş. Konik Işın Hüzmeli Bilgisayarlı Tomografi Kullanılan bir Vakada İnternal Rezorbtif Defektlerin Tedavisi. Cumhuriyet Dent J 2014;17( Supp 1):40-46.